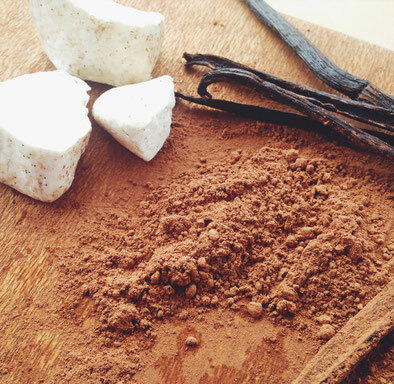 We ensure that our suppliers adhere to our exacting standards in the growing and preparation of our ingredients. Everything must be grown and certified to organic standards and prepared at a temperature no higher than 42 degrees – remaining raw to guarantee the preservation of the highest possible nutritional content. 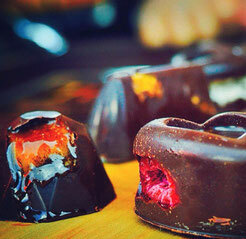 We have them brought to our kitchen door in small batches where they are magically transformed from mere organic ingredients into raw gourmet chocolates and treats ready to delight your senses and nourish you from the inside out. Sarah splits the vanilla pods with a sharp knife and carefully scrapes out the seeds which are rich in aroma and full of the characteristic vanilla flavor that Sarah uses to balance the cacao’s natural bitterness. The seeds are set aside ready to be added later. She then carefully melts her cacao butter never going above 42 degrees before lovingly stirring in generous scoopfuls of raw cacao powder. At the optimum moment Sarah adds a minimal serving of Mexican blue dark agave or Indonesian coconut blossum nectar before finally adding an extremely generous serving of ‘freshly scraped vanilla pods’- the ones she prepared earlier. 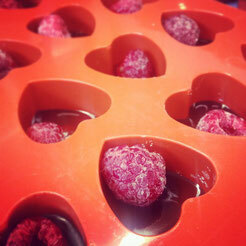 While Sarah’s cacao butter slowly softened over hot water, she prepared a unique and eclectic range of delicious and nutritious organic goodies - raspberries, hand-made caramalised ginger, davidson plum, pistachios, almonds and organic therapeutic grade essential oil of sweet orange are just a handful. The rich, smooth, velvety, chocolate mixture is then poured over the specially prepared ingredients and set in the refrigerator. When set, the delicious, organic, raw, vegan Puremelt Chocolate is then hand wrapped with great care and love - ready to make its way to you. 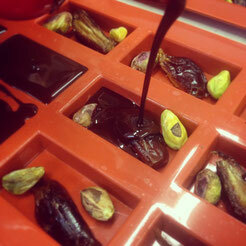 The most important ingredient that Sarah adds to all of her work is very special indeed - 100% pure love. She pours it in by the bucket load to make sure that you can taste it in every bite. 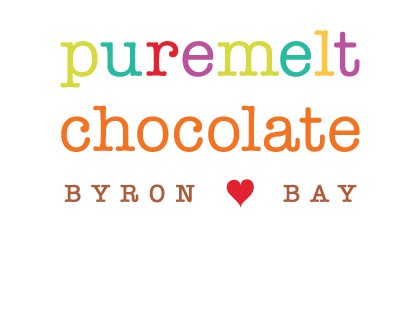 Delicious treats that are packed full of goodness is what you can expect every-time you pick up something made by Sarah and her small team at Puremelt Chocolate Byron Bay. Sarah and her small dedicated team have been recognized and awarded for some of the amazing work they do. 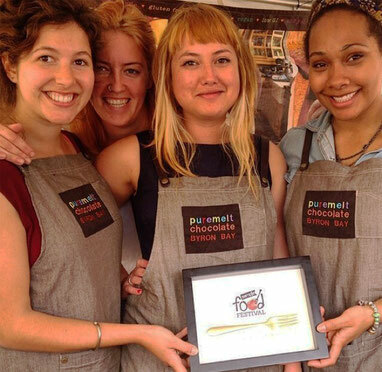 In 2014 at the Sample Food festival in Bangalow, Puremelt walked off with the Golden Fork for the $10 taste plate which included a gluten free brownie and 2 chocolates. 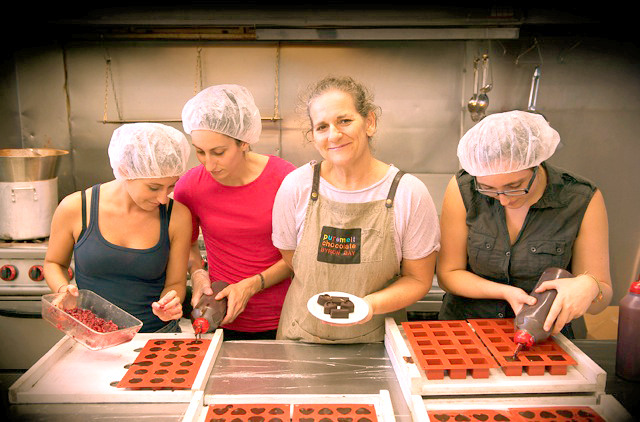 In 2015 Puremelt brownies took home a Bronze Medal from the Royal Melbourne Fine Food Awards.